A model of great ape history during the past 15 million years has been fashioned through the study of genetic variation in a large panel of humans, chimpanzees, gorillas and orangutans. The catalog of great ape genetic diversity, the most comprehensive ever, elucidates the evolution and population histories of great apes from Africa and Indonesia. The resource will likely also aid in current and future conservation efforts which strive to preserve natural genetic diversity in populations. More than 75 scientists and wildlife conservationists from around the world assisted the genetic analysis of 79 wild and captive-born great apes. They represent all six great ape species: chimpanzee, bonobo, Sumatran orangutan, Bornean orangutan, eastern gorilla, and western lowland gorilla, and seven subspecies. Nine human genomes were included in the sampling. Javier Prado-Martinez, working with Tomas Marques-Bonet at the Universitat Pompeu Fabra in Barcelona, Spain, and Peter H. Sudmant, with Evan Eichler at the University of Washington in Seattle, led the project. 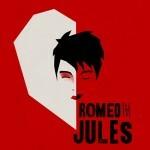 The report appeared, July 3 in the journal Nature. Read the Nature paper. “The research provided us the deepest survey to date of great ape genetic diversity with evolutionary insights into the divergence and emergence of great-ape species,” noted Eichler, a UW professor of genome sciences and a Howard Hughes Medical Institute Investigator. Genetic variation among great apes had been largeley uncharted, due to the difficuty in obtaining genetic specimens from wild apes. Conservationists in many countries, some of them in dangerous or isolated locations, helped in this recent effort, and the research team credits them for the success of the project. Sudmant, a UW graduate student in genome sciences, said, “Gathering this data is critical to understanding differences between great ape species, and separating aspects of the genetic code that distinguish humans from other primates.” Analysis of great ape genetic diversity is likely to reveal ways that natural selection, population growth and collapse, geographic isolation and migration, climate and geological changes, and other factors shaped primate evolution. Sudmant added that learning more about great ape genetic diversity also contributes to knowledge about disease susceptibility among various primate species. Such questions are important to both conservation efforts and to human health. The ebola virus is responsible for thousands of gorilla and chimpanzee deaths in Africa and the origin of HIV, the virus which causes AIDs, is SIV, simian immunodeficiency virus. Sudmant works in a lab that studies both primate evolutionary biology and neuropsychiatric diseases such as autism, schizophrenia, developmental delay, and cognitive and behavioral disorders. 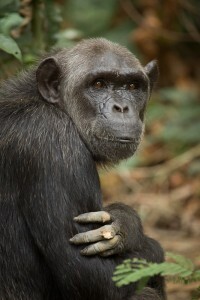 “Because the way we think, communicate and act is what makes us distinctively human,” Sudmant said, “we are specifically looking for the genetic differences between humans and other great apes that might confer these traits.” Those species differences may direct researchers to portions of the human genome associated with cognition, speech or behavior, providing clues to which mutations might underlie neurological disease. In a companion paper published this week in Genome Research, Sudmant and Eichler wrote that they inadvertently found the first genetic evidence in a chimpanzee of a disorder resembling Smith-Magenis syndrome, a disabling physical, mental and behavioral condition in humans. Strikingly, the veterinary records of this chimpanzee named Suzie-A, matched almost exactly to the symptoms of human Smith Magenis patients; she was overweight, rage-prone, had a curved-spine chimp and died from kidney failure. The discovery came about while researchers were exploring and comparing the accumulation of copy number variants during great ape evolution. Copy number variants are differences between individuals, populations or species in the number of times specific segments of DNA appear. Duplication and deletion of DNA segments have re-structured the genomes of humans and great apes , and are behind many genetic diseases. In addition to offering a view of the origins of humans and their disorders, the new resource of ape genetic diversity will help address the challenging plight of great ape species on the brink extinction. The resource provides an important tool to enable biologists to identify the origin of great apes poached for their body parts or hunted down for bush meat. The research also explains why current zoo breeding programs, which have attempted to increase the genetic diversity of captive great ape populations, have resulted in captive ape populations that are genetically dissimilar to their wild counterparts. .
“By avoiding inbreeding to produce a diverse population, zoos and conservation groups may be entirely eroding genetic signals specific to certain populations in specific geographic locations in the wild” Sudmant said. 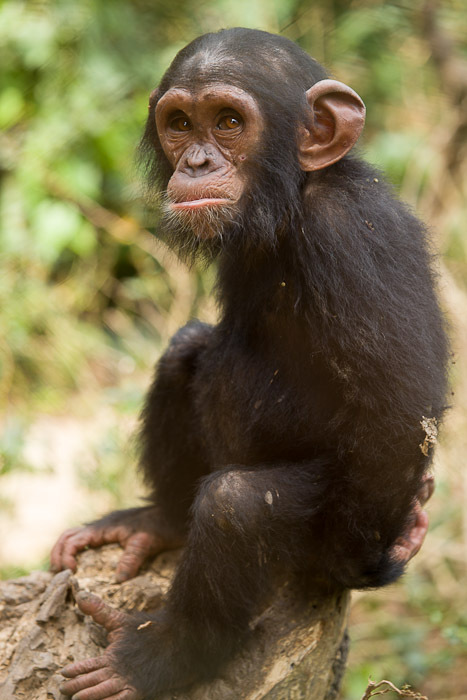 One of the captive-bred apes studied by the researchers, Donald, had the genetic makeup of two distinct chimpanzee subspecies, located more than 1,240 miles away from each other. 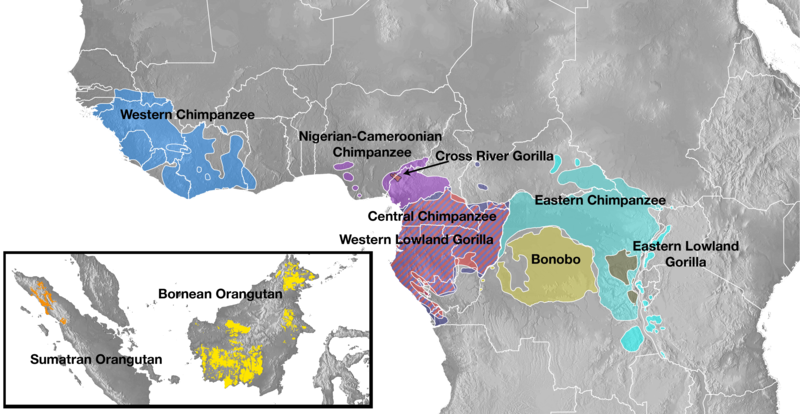 The research also delineates the many changes that occurred along each of the ape lineages as they became separated from each other through migration, geological change and climate events. The formation of rivers, the partition of islands from the mainland, and other natural disturbances have all served to isolate groups of apes. Isolated populations may then be exposed to a unique set of environmental pressures, resulting in population fluctuations and adaptations depending on the circumstances. Even though early human-like species were present at the same time as the ancestors of some present day great apes, the researchers found that the evolutionary history of ancestral great ape populations was far more complex than that of humans. Compared to our closest relatives, chimpanzees, human history appears “almost boring” conclude Sudmant and his mentor Evan Eicher. The last few million years of chimpanzee evolutionary history are fraught with population explosions followed by implosions demonstrating remarkable plasticity. The reasons for these fluctuations in chimpanzee population size long before our own population explosion are still unknown however. Sudmant said his interest in studying the great apes, and wanting to preserve great ape species, stems from the similarity of great apes to humans and their curiosity about us. 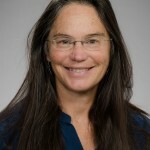 The two Univerity of Washington studies, Great ape genetic diversity and population history, published in Nature, and Evolution and diversity of copy number variation in the great ape lineage, published in Genome Research, are funded by NIH grant HG002385 and support from the Howard Hughes Medical Institute. Peter Sudmant is a Howard Hughes Medical Institute International Student Fellow.